I purchased 2 of these chairs for my kitchen....they are so durable. 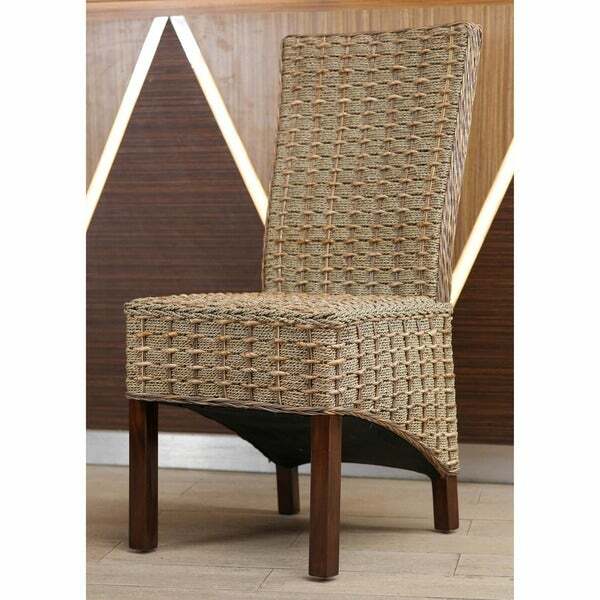 Create an exotic spot in your home with this stylish beige dining chair by International Caravan Home Furnishings. This rustic dining chair features a hand-woven Bayu design that creates a subtle checkered pattern. The mahogany hardwood frame is durable and designed to withstand years of use, making this chair a beautiful addition to any dining table. 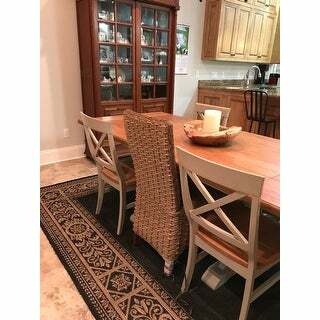 A rustic piece with Eastern flavor, this woven natural-fiber cover sits atop a warm mahogany frame in a combination that is sure to grab attention. The jute-colored weaving is accented by sturdy golden rope threads. The chair features a high back and looks great as an accent piece or as a set. I'm totally satisfied with these chairs. I ordered six to go with a rectangular antique table. they ccme fully assembled with each chair shipped in its own giant box. every part of the chair, including the legs, are fully wrapped and protected during shipping. Out of sight under the chair is a fabric under cover. Quality heavy sturdy chair. Love the style of these chairs. We just bought a mid century ranch style home with an eat in kitchen, no formal dinning room. I love the fact that it is casual enough for the room with a touch of classiness of the modern style we were looking for. Just waiting to pair it with our farm style table. Highly recommend. The most beautiful chairs to see. They go perfect with my dining table. I highly recommend. This chair is exactly as pictured, well built and sturdy, and makes a perfect statement piece in a grouping or in a corner, as well as a dining chair! These chairs are great. I bought four to go with an existing dining set that I have. They elevate my space and take the country edge off my farmhouse table. They are neutral but have enough character to add some interest. They come fully assembled which is great. Love them. The seat is a little hard but backs are comfy. They look elegant. Pulled them out of a box and they were ready to use. No assembly. Looks well made. The 4 chairs arrived wrapped in bubble wrap and cardboard inside each of their own box, fully assembled. They are beautifully made, a more brown than light tan in color but fits in with my decor just right. Have been looking for new chairs and saw these and just knew they would be perfect. All the previous comments helped seal my decision. Wanted Seagrass but in lighter shade to brighten my dark breakfast nook table. They compliment it perfectly. The chairs all arrived in great condition fully assembled (bonus) ...highly recommend! I purchased two and they are so great! Well made, great price, perfect accent chair! Delivery on time but the Quality wasn't good. Hard to ist on with out any cuschion. "What is the weight limit for these chairs?" "Is the rattan color a gray or green please?" Hello carlapar, we try to represent the colors of our products accurately. Unfortunately, due to the difference in monitor colors we cannot guarantee that the color will match exactly what you see on your screen. In my opinion this is tan. Thank you for shopping with us. "What is the height of the chair seat from the floor to the seat?" Hello wyvernsea, the seat height is approximately 18 1/2 inches from the floor to the top of the seat. Thank you for shopping with us! Moving to new home and this will fit perfectly with my rustic table. It is going to accent the dining table perfectly. "Are these comfortable w/o a cushion? Do they scratch skin or snag clothes? How would you describe the colors? Thank you!" Hello Karen, we appreciate your inquiry. Yes, these chairs can comfortably used without cushions, and it shouldn't snag fairly sturdy fabric/material. We hope this information has been helpful. Thank you for shopping with us! "what is the height of the chair set? Thanks"
Hello Gina, this chair is 40 inches high. Thank you for shopping with us!